A Class 5A Top 10 confrontation for the Region 4-6A title is set for Hallford Stadium on Friday night at 7:30 as the No. 8 ranked Stephenson Jaguars host the No. 3 ranked Tucker Tigers. Both the Jaguars (8-1) and the Tigers (7-2) come into the regular season finale undefeated at 7-0 in the region standings. 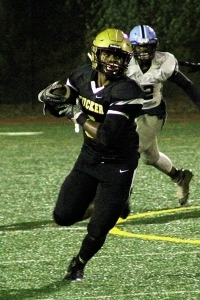 The two perennial state playoff teams from DeKalb are meeting for just the fifth time with Tucker holding a 3-1 edge in the series having won three in a row. The two teams met for the first time in regular season play in 2012 in a Region 6-5A contest with the No. 4 Jaguars upsetting the No. 1 ranked Tigers 13-6. The teams met in 2013 with then No. 1 ranked Tucker taking a 31-8 win over No. 2 Stephenson. Reclassification separated the two teams in 2014-15 before they came back together in 4-6A in 2016. Tucker won 31-0 in 2016 and 38-0 a year ago. Tucker enters game at No. 3 in the rankings and having won seven consecutive games since losses to Buford and Grayson to open the season. As a team the Tigers have rushed for 2,495 yards and 30 touchdowns including 327 yards and five touchdowns in their 57-7 win over Mt. Zion-Jonesboro last Thursday. Tyler Hughey leads the team with 762 yards rushing and 9 touchdowns with Donnie Harris with 738 yards and 7 touchdowns on the ground. Freshman Latavius Johnson is coming off a 95-yard performance with a pair of touchdowns against Mt. Zion. Quarterback Travon Ford is 45 of 74 passing for 785 yards and 7 touchdowns. Torezz Alexander had 12 receptions for 265 yards and four touchdowns while Isaiah Dunson has 15 for 263 yards and 2 touchdowns. The defense is led by senior linebacker Lucius Chitty with 68 tackles (3 for a loss) while senior defensive end Derrick McClendon had 40 tackles (8 sacks) and sophomore defensive end Dawson Rivers in limited action has 26 tackles (6 sacks). Stephenson enters the game ranked No. 8 and also on a seven game win streak since losing a tough 21-14 overtime decision to Class 5A No. 9 ranked Southwest DeKalb (9-0). The Jaguars are also a strong running team having 2,525 yards on the ground with 35 touchdowns, including 356 yards and four touchdowns in a 44-35 win over third place Lovejoy last Friday. Senior Jevon Goff is coming off a 24 carry, 174 yard and 2 touchdown performance against Lovejoy and leads the team with 668 yards rushing. Junior Ryan Ingram has 592 yards rushing and a team leading 11 touchdowns with 9 receptions for 230 yards and 3 touchdowns. 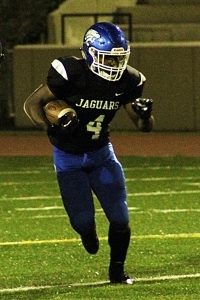 Donovan Moore has 436 yards rushing and six touchdowns in five games. Sophomore quarterback Joseph Jackson is 38 of 65 passing for 715 yards and 8 touchdowns on the season. He was 6 0f 9 for 179 yards and 2 touchdowns against Lovejoy. Deshon Stoudemire adds 10 receptions for 210 yards and 3 touchdowns to Ingram’s totals. Defensively, the Jaguars have allowed just 958 yards rushing per game and only eight touchdowns led by sophomore linebacker Omari Terry (69 tackles, 5 for loss) and senior defensive lineman Tyler Brown (69 tackles, 4 for loss). Senior defensive lineman Jamal Andrews had 68 tackles (4 sacks, 11 for loss) and senior linebacker Tra’ Wilkins adds 67 tackles, (4 sacks, 9 for loss). The winner takes home the Region 4-6A crown and the No. 1 seed with a home game to open the playoffs while the loser gets to open the home playoffs at home as well. Playoff berths and seeding are still up in the air in the all-DeKalb Region 5-5A race with only No. 9 ranked Southwest DeKalb (9-0, 4-0) assured of the No. 1 seed heading into the final week of play. The Arabia Mountain Rams (5-4, 3-1) and Lithonia Bulldogs (6-3, 3-1) lock up at Adams Stadium on Friday at 7:30 pm in a contest to decide the No. 2 and 3 seeds with a first round playoff home game on the line. The Rams are coming off a tough last minute, 20-19 loss to Southwest DeKalb last weekend and are looking to bounce back against the Bulldogs who are coming off a 42-30 win over Miller Grove. It is senior night for the Bulldogs. Miller Grove (2-7, 1-3) are hosting Chamblee (0-9, 0-4) on senior night with a 5:15 game at Hallford Stadium. Miller Grove needs a win to assure itself of the No. 4 seed coming out of the region. Columbia (2-7, 1-3) could slip into the playoffs with a Miller Grove loss and a win over undefeated Southwest DeKalb at Avondale Stadium on Friday at 7:30 as the Eagles celebrate senior night. The No. 2 ranked Cedar Grove Saints (8-1, 5-0) come off a bye week to take on the Stone Mountain Pirates (2-7, 2-3) with the opportunity to close out a second consecutive Region 5-3A title without a region loss. The game is set for 8:00 pm on Friday at Godfrey Stadium. Towers (0-8, 0-5) and Redan (0-8, 05) collide at 7:30 pm on Saturday at Avondale Stadium with both teams looking for their first win on the season.